Indian Council of Agricultural Research (ICAR) to re-conduct 23rd AIEEA 2018 entrance examination on 18 and 19 August. Mr. V.K. 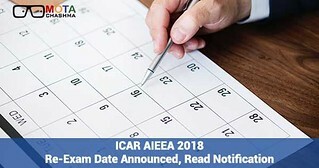 Sharma, the Deputy Secretary of competent authority ICAR, has informed about the re-exam of ICAR entrance examination through a notice released on 24 July. ICAR 2018 re-exam will be conducted in offline mode (OMR based) at 56 cities across the country. Only the registered aspirants who have applied earlier can appear for ICAR re-examination. However, the detailed information for re-conducting of ICAR AIEEA 2018 examination will be provided later. On 12 July 2018, Madras High Court ordered ICAR to re-conduct the AIEEA entrance examination for admission to 1799 UG and 471 PG seats offered by State Agricultural and Deemed Universities. Read the complete story on Madras HC decision on ICAR re-exam here. The official notification released by ICAR states that "the ICAR entrance examination conducted on 22 and 23 June 2018 for admissions to UG, PG and PhD courses for the academic session 2018-19. It has now been decided with the approval of Competent Authority that ICAR to re-conduct the examination in offline mode (OMR based) on 18 and 19 August 2018 at 56 examination cities all over the country. Along with that, the examination will be limited to only those candidates who have applied earlier." Earlier on 12 July 2018, ICAR released a notification confirming to re-conduct the 23rd AIEEA entrance examination. However, no dates were specified at that time. 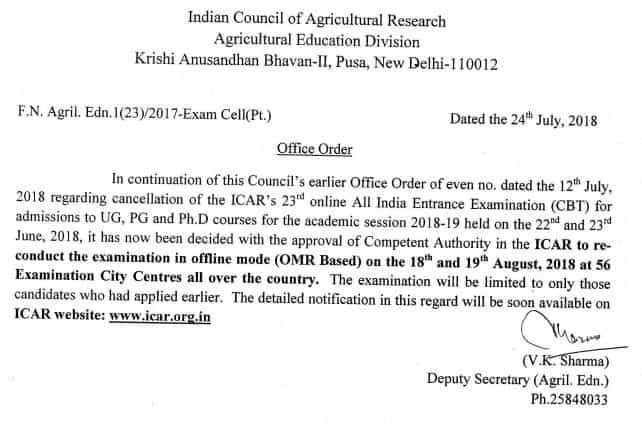 It stated that "With the approval of competent authority in the Indian Council of Agricultural Research to cancel the ICAR's 23rd online All India Entrance Examination (CBT) for admission to UG, PG and PhD courses held on 22 and 23 June 2018 due to administrative reasons." Read completed details on ICAR AIEEA 2018 exam cancelled here. On 4 July 2018, a resident of Madras filed a petition in the Madras HC requesting for re-conduction of ICAR AIEEA 2018 entrance examination. As per the petition filed, the daughter of petitioner, M. Priyadarshini faced a lot of technical problems during the examination, due to the 23rd ICAR AIEEA entrance examination was delayed for one and a half hour. Therefore, she was unable to answer all the questions within the stipulated period of time. All the 32 candidates in the centre faced the same problem. Earlier, the ICAR AIEEA result 2018 was expected to be announced in the first week of June, which will now be available after the re-exam. Students can stay tuned to Motachashma for latest news of ICAR result and dates.